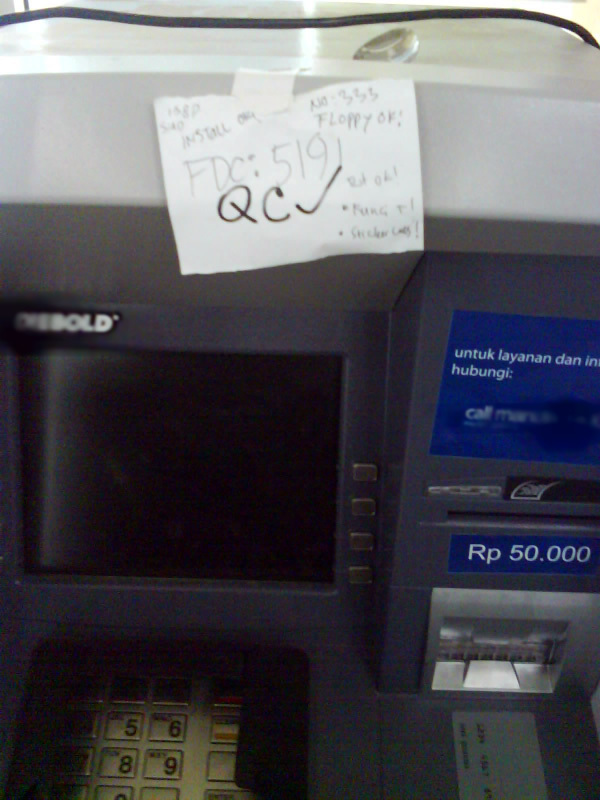 Yesterday, when I and my wife go to one of the supermarket near from our house, there is one ATM machine with some notes attached at the top of the machine. 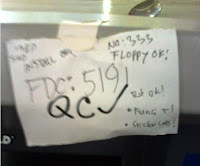 Sure, it takes all of my attention, this is an ATM machine, a note must be somethin important if somebody (you?) know how to manage it. Yes.. we often seeing a "malfunction ATM" notes also, here in Indonesia :), but this time its different for me. This type of vulnerabillities also known as Information Disclousure (you can judge by yourself the threat level/disclousure score), every company or mostly bank should have this kind of policy, i mean Information Disclosure Policy.Looking to the image, what kind of information we can get ? (i dont know about you, i ... do think theres such an information to combine with some social engineering black magic, at least some number to play with), remember all information are important in "gathering data" steps/phase. Poor for the company, because this kind of human mistake/error would lead to some problem (or.. this is their legal mechanism to tell another engineer about the ATM status? .. gyahh), at least if they had already get some certification/standarization, there will be some question mark into their certification. I know, i know.... this wouldn't be a problem for "some" company/governement in our beloved country :). Well, for a moment, it gives me best idea to take a picture of it :). Dont worry.. its not a problem anyway, just for photos fun. Ow... really ?